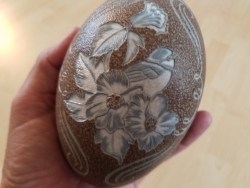 This DVD will take you step-by-step through the process of relief carving on an Emu eggshell. This egg is fascinating--it has a multilayered shell with each layer being a different color! The outside is deep green, the middle is aqua and the last layer is white. Some even have 4 layers. The last two are different whites. The color combination offers unlimited opportunities for your designs to come alive. You will learn how to apply your stencil onto the shell and relief carve your design onto it. You will also learn the technique of using the multi-layers to make your Emu shell a beautiful creation.